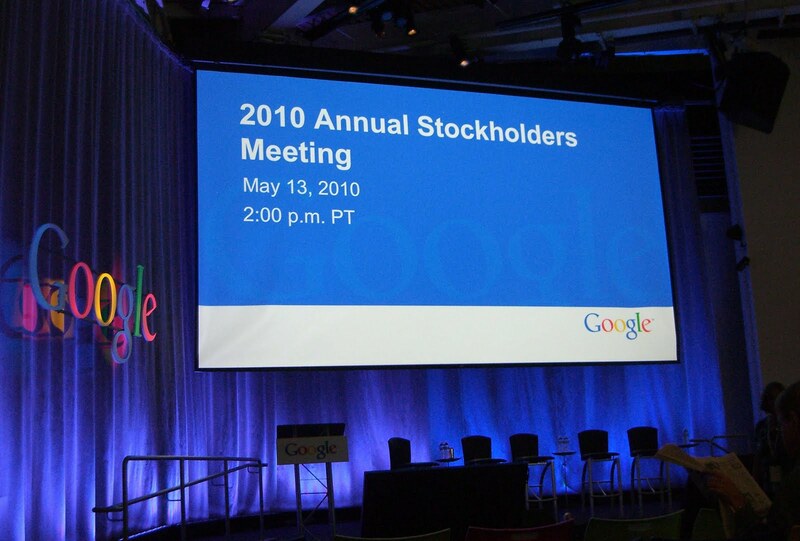 Just back from Google's annual stockholders meeting. It was a fun experience. A sunny Mountain View day meant we could eat the great lunch they served outside. Eric Schmidt's speech was informative and entertaining, and Larry Page joined the crowd unannounced. Like every year, 3 proposal having to do with Google dealing with issues like transparency, privacy and and human rights were brought up - and voted down (see my post from 2 years ago). The part that pissed me off the most was when Kent Walker, Google's general council, announced the vote on the proposal, noting that they already know the answers since the majority of stocks have been voted by proxy. That means no matter what I voted for (and I of course voted "for" on all 3 proposals) - I already lost. Oh well, guess i need 20 million shares, rather than 20 to make a difference. While I'm not allowed to comment on the financial aspects of the meeting, until the report is made public, I can tell you about a couple of the questions. An elderly woman complained that she did not get the proper invite to the meeting in time. She tried the web site, emailing and even calling Google - but got no proper answer. That caused her to arrive late to the meeting and miss lunch. Dr. Schmidt appologized and invited her to lunch next year. When another person complained about the same, he became more serious and asked his staff to check the site. Another woman asked whether Google has decided already on the US city they are going to provide with gigabit networking. When she was told that the decision has not been made yet, she revealed she was here on behalf of the town of Frederick, MD. She bought an old Jeep, colored it blue, added Google logos, changed the license number to "Feeling Lucky" and drove 3150 miles to the meeting to try to convince Google to pick her town as the recipient. Everyone clapped and Larry and Eric found that extremely funny.